Heated protests, chaos in Kyiv, the fall of one government and the rapid emergence of another—these are the images presented to the world of Ukraine today. 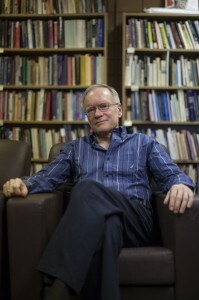 But for John Jaworsky, a professor of political science at the University of Waterloo, the conflict hits closer to home. An avid member of Kitchener-Waterloo’s Ukranian community, Jaworksy offered up his professional opinion and insight on the recent conflicts overseas. “[Vladimir] Putin, seems to be looking for an excuse to give Ukrainians a lesson, to show he is unhappy about the new government,” he said. According to Jaworsky, the background of the crisis is quite complex. Protests in Ukraine originally began in November in the capital of Kyiv when former president, Viktor Yanukovych, backtracked on signing an Association Agreement with the European Union. The authority of President Yanukovych was increasingly undermined by growing evidence of massive government corruption. In January, the government introduced harsh anti-protest legislation. “The president took a number of authoritarian steps which involved cutting back on human rights, the right of citizens to protest and media freedom,” Jaworksy said. Then, Feb. 18-20 saw several dozen protesters killed, mostly by sniper fire. In the aftermath of this violence an agreement between the government and the opposition collapsed, Yanukovych abandoned his post and fled Kyiv and a new government began to form. Now a new issue has emerged — Russian invasion. Jaworksy says that Putin has declared the new government in Ukraine to be “illegitimate,” claiming that “extreme nationalists” back it. He argues that Russian authority believes it has to intervene in Ukraine to protect the rights of the country’s ethnic Russian minority. Jaworsky thinks that a large-scale military conflict between Russia and Ukraine is unlikely, but there is a chance that a minor incident could trigger bloodshed. “I’m not saying that Putin is planning or hoping for war, but the Russian troops in Crimea are looking for a reason to be there, and some of their activities have been very provocative,” stated Jaworsky. He is optimistic that Ukraine’s new government will achieve some success under the right conditions. The new government is determined to combat corruption, a chronic problem in Ukraine, and is prepared to act in a more democratic fashion than the previous Yanukovych government. Yuliya Chervona, a political science student at Wilfrid Laurier University and former president of the Laurier Ukranian Club also weighed in. “The international community needs to play a larger role in ending the conflict,” she said. She continued to share that despite possible resolutions, citizens in Ukraine are still uncertain about their future. Chervona has family who are currently living under these conditions. “As someone who has family in Ukraine, it is terrifying. Having talked to family who still lives there, they do not know day-to-day if a war is going to break out,” she said. I guess you weren’t in Toronto during the G20 Summit. Putin or Harper. Whomever is pro-American is the winner. That’s the problem with Canada’s viewpoint on Ukraine. It’s an American viewpoint. It’s not an individual one. And it’s definitely not the viewpoint of Canadians.